Enjoy the perfect balance of back support and smooth motion with the Amish Cedar Wood Contoured Swivel Glider. This outdoor furniture is sure to become your go to place to relax and unwind with the finest display of Amish craftsmanship adding to your outdoor scene. Turn side to side as you socialize on the patio or rock back and forth on the built in glider as you enjoy the fresh air. It's the best of both worlds and there's more to come with the eco friendly nature of this swivel glider. This cedar outdoor furniture is from our Green Wood Collection, perfect for supporting a green household. 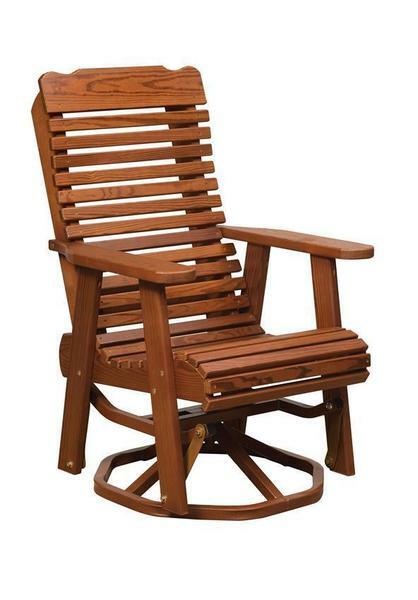 Amish woodworkers use thermally modified wood for this outdoor chair, which reduces chances of the wood rotting, decaying, splintering or warping. Sealed with Pure Wood Sealer means this chair is chemical free as well. Aromatic red cedar wood is ideal for your wooden outdoor furniture as it naturally resists decay and repels insects that wish to invade.